New Delhi: The International Monetary Fund (IMF) on Tuesday said India should address labour market rigidities to create more jobs and undertake financial sector reforms to improve governance in public sector banks to contain downside risks to its medium-term growth prospects. In its biannual World Economic Outlook, IMF kept its GDP growth forecast for India unchanged at 7.4% for 2018-19 and 7.9% for 2019-20, holding that economic activity will be lifted by strong private consumption as well as fading transitory effects of demonetisation of high-value currencies and implementation of the national goods and services tax (GST). “Over the medium term, growth is expected to gradually rise with continued implementation of structural reforms that raise productivity and incentivise private investment," it added. The Asian Development Bank and the World Bank have projected the Indian economy to grow at 7.3% in 2018-19. Global growth is projected to pick up to 3.9% this year and next, supported by strong momentum, favourable market sentiment, accommodative financial conditions, and the domestic and international repercussions of expansionary fiscal policy in the US. However, over the medium term, global growth is projected to decline to about 3.7% due to a shift toward inward-looking policies that harm international trade and a potential further buildup of financial vulnerabilities that could give way to rapid tightening of global financial conditions. Over the medium term, China’s growth is expected to gradually slow to 5.5% from 6.6% in 2018 with continued rebalancing from investment to consumption. “However, rising non-financial debt as a share of GDP and the accumulation of vulnerabilities weigh on the medium-term outlook," IMF added. 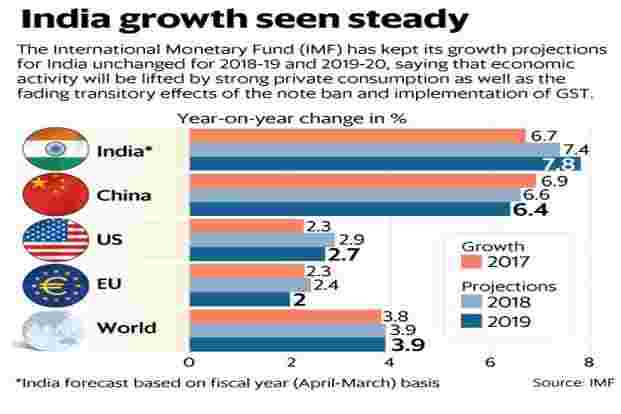 IMF said while acceleration in India’s growth in the medium term will provide some offset to China’s gradual slowdown, an important challenge for India is to enhance inclusiveness. “The main priorities for lifting constraints on job creation and ensuring that the demographic dividend is not wasted are to ease labor market rigidities, reduce infrastructure bottlenecks, and improve educational outcomes," it said. The multilateral lending institution said the balance sheet vulnerabilities in India pose a downside risk to its medium-term growth prospects, requiring policy action. “The corporate debt overhang and associated banking sector credit quality concerns exert a drag on investment in India. The recapitalization plan for major public sector banks announced in 2017 will help replenish capital buffers and improve the banking sector’s ability to support growth. However, recapitalization should be part of a broader package of financial reforms to improve the governance of public sector banks, and banks’ debt recovery mechanisms should be further enhanced," it said. IMF said India’s high public debt and recent failure to achieve the budget’s deficit target call for continued fiscal consolidation into the medium term to further strengthen fiscal policy credibility. However, in a surprising change in stance, IMF said improvements to monetary policy frameworks appear to have lowered inflation expectations in India. “These developments have created room for monetary policy to support activity should downside risks to growth materialize," it said, at a time most analysts believe a long pause from the Reserve Bank of India on policy rates.